Iain Lawrence knows a thing or two about adventure in the wilderness: he’s been a logger, a firefighter, and a fish farmer, among other things. The author brings the full force of this experience to The Skeleton Tree, a gritty story set in Alaska. The narrator, 12-year old Chris, is excited but wary when his free-spirited Uncle Jack invites him on a sailing trip from Kodiak, Alaska, to Vancouver. When he arrives at the dock, Chris discovers that a third passenger is joining them. Frank, a few years older than Chris, greets the younger boy with a mixture of disdain and indifference. The two have no time to resolve their issues before a violent storm sinks the boat and Uncle Jack drowns. Chris and Frank make it ashore, but their antipathy grows as they face their frightening new situation. After finding shelter in a rough cabin, Chris befriends a raven, which offers him comfort but incites Frank’s anger and jealousy. The Alaskan backdrop to the boys’ conflict is both magnificent and menacing, and the skeleton tree of the title, holding coffins in its gnarled branches, serves as the book’s central motif. The tree and the raven both reference aboriginal spiritualism, in which man and nature are one. 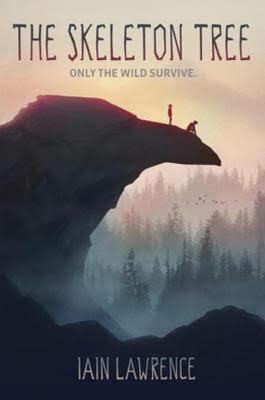 As they fight for survival and reveal long-held secrets, Frank and Chris learn respect for the harshly beautiful environment and each other. From start to finish, Lawrence takes the boys on a wild ride, bombarding them with moments of terror and triumph. The novel won’t disappoint thrill seekers, but in between the action sequences, there are quieter moments of compassion and insight, which Lawrence delivers equally well.